I have been a Toastmaster for the past seven years. 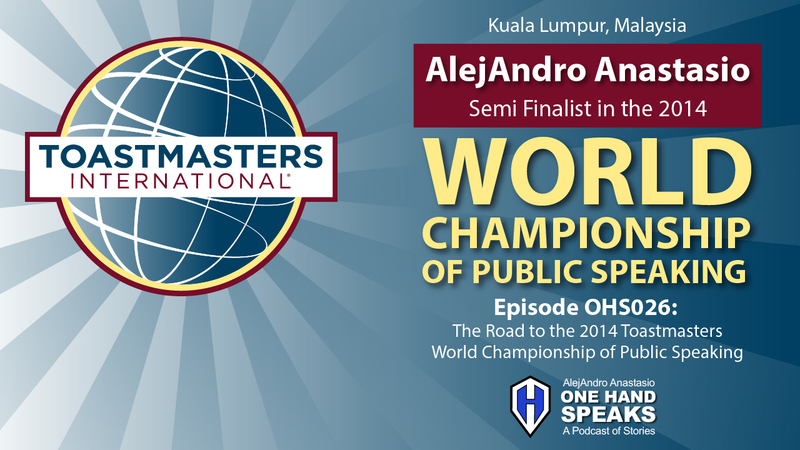 This week’s podcast will cover my experience, insights, and advice about competing in the 2014 Toastmasters World Championship of Public Speaking in Kuala Lumpur, Malaysia. So much of this competition is about practicing and writing a great speech. If I had to say, I will say it is more about the writing of the speech. Delivery is key but I feel it is the better written speech that gives a competitor the advantage. I have heard a great speech is not written, it is rewritten. To get to the Semi-Finals I had to win the previous four competitions at the club, area, division, and district levels. Each one requiring a better speech and delivery while at the same time battling with stronger and stronger competitors. My ultimate goal was to make it to the final round of the top ten. To do so I would have to win my semi-final round. I did not. However, I did learn a lot about speaking, writing, competing, and about myself. Competing at the Toastmasters World Championship of Public Speaking. Advice of the nature of practicing and writing a speech. What I learned about speaking, storytelling, writing a speech, and about myself. Melaka, Malaysia – I spent time here with the Queen of Melaka, The King of Tea, and with a Hindu Vedic Priest. Borobudur Buddhist Temple – a 9th-century Mahayana Buddhist temple in Magelang, Central Java, Indonesia. Kopi Luwak Coffee – Civet Cat coffee or “Cat-Poo-Cino” from the island of Java in Indonesnia.